For all of its recent emphasis on its Surface tablet and the Xbox, Microsoft remains focused on the enterprise, and especially on the cloud—but its consumer offerings are a gateway, Microsoft executives said. 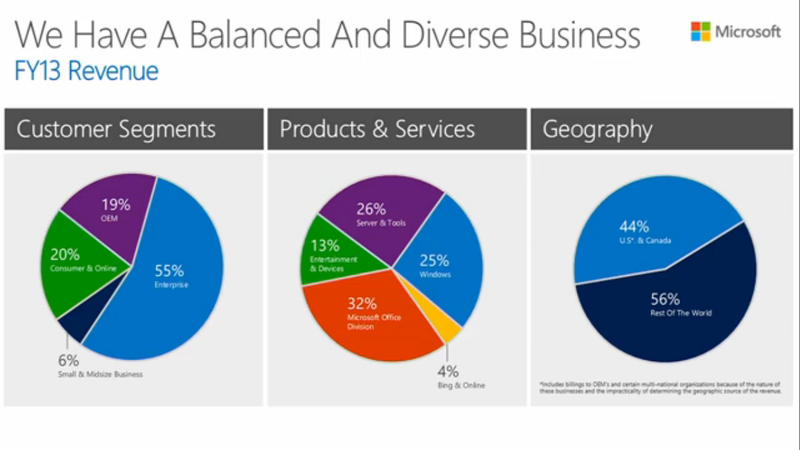 Microsoft chief operating officer Kevin Turner opened Microsoft’s 2013 financial analyst meeting by disclosing that more than 55 percent of Microsoft’s revenue comes from the enterprise, a number that he said Microsoft rarely discloses. Other key executives, such as chief executive Steve Ballmer, are expected later in the meeting's day, which runs until 5 PM PDT. Wall Street may have hoped that Microsoft would answer some uncomfortable questions, beginning with Microsoft’s unexpected shakeup. In July, Ballmer announced a sweeping reorganization that flattened the corporate structure and placed the company’s key technologies in the spotlight, rather than making the individual products the focus. Microsoft’s acquisition of Nokia helped boost Elop’s apparent chances. Unfortunately, Amy Hood, Microsoft’s chief financial officer, introduced the conference by saying that the company would be offering no new updates on the succession process. 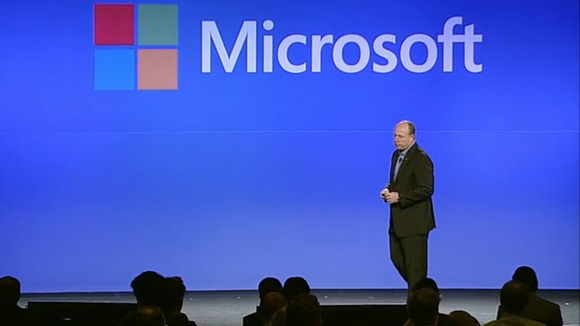 Kevin Turner, another candidate to succeed Ballmer, first appeared on stage to present Microsoft’s business strategy and where the company has succeeded. So far, that appears to be in the cloud. Microsoft’s Turner also pooh-poohed the negative response from OEM competitors to some of Microsoft’s own hardware plays, like the Surface. Turner referred to the consternation in the OEM channel when Microsoft launched Surface, with OEMs complaining about competition from Microsoft itself. “We don”t want to make all the devices... but we will make some first-party hardware,” Turner said. Microsoft has 460 million MSN customers, 8 million Xbox Live customers, and Bing fields 4.6 billion queries per month. More than 400 million people use Outlook.com, Turner said, after Microsoft made it “more vibrant” and refreshed it, he said. In the enterprise, Microsoft should move from a $1.5 billion annual revenue rate with Office 365 this quarter, and “blow that away” later this year, Turner said. Microsoft’s enterprise, public-cloud service in China is the only one of its kind in the world, he said. Social media in the enterprise represents a $38 billion opportunity today, Turner said. About 85 percent of Fortune 500 companies use Yammer, while 90 out of the Fortune 100 companies use Microsoft’s enterprise collaboration tool, Lync. 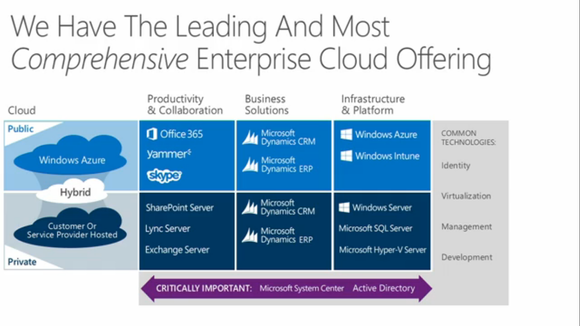 Lync is a billion-dollar product; Skype has 320 million users. Together, Lync, Yammer, Skype, and SharePoint in the enterprise make up a “incredibly compelling story” in the enterprise space, Turner said. The Haswell or fourth-generation Core processor from Intel gives Microsoft the capability to have a fanless device on a better platform,” Turner said. That will open up new form factors at new price points, he said, and Microsoft is working hard across with partners to make that happen. ”The one thing we know about Windows Phone: when people use it, they really really like it,” Turner said. Turner acknowledged that Windows Phone was a distant third behind Android and iOS, but with year-over-year gains like 900 percent in India, the company holds out hope that it will close the gap. Turner talked up its its Nokia acquisition, but also highlighted partners such as Samsung and several Asian partners. A power outage then interrupted the meeting. When it returned, Microsoft executives detailed their commitment to Windows RT versions of the Surface tablet. Finally, Microsoft chief executive Steve Ballmer appeared on stage to outline his four keys to Microsoft's future and his pledge to serve as a cheerleader for the company even after he steps down as chief executive.